Located in beautiful (so I’m told) Wolfville, Nova Scotia, Canada, Gaspereau Vineyards is the original winery in the area and is known primarily for its Rieslings and other lesser-known varieties including Seyval Blanc, L’Acadie Blanc, Muscat and reds, Lucie Kuhlmann, Marechal Foch and Baco Noir. These are all hybrids (save for, of course, the Riesling) that thrive in cool and wet vineyards with truncated growing and ripening windows. How perfect they are for the winemakers of Nova Scotia. I wish I’d thought ahead and gone to some effort to prepare oysters on the half shell or mussels in a white sauce with garlic. I can virtually taste them as I’m sipping this wine on one of the last days of summer here on the opposite Canadian coast. Pale lemon with light legs, the nose is clean with medium intense aromas of honeysuckle, guava, light green grass, lemony citrus and a hint of minerality. The palate is dry but carries a sweet impression with the honeysuckle, some pear, more soft lemon, Granny Smith apple and a light touch of almond bitterness. Medium alcohol, acidity and medium body complement the medium finish. Light, youthful and truly lovely – a solid WSET ‘Good’. I wish this was available here in BC – I’d certainly buy it. Well priced, balanced and refreshing. Drink now; do not age. Thanks, Vancouver’s Nova Scotian ambassadors, Sean and Julie. 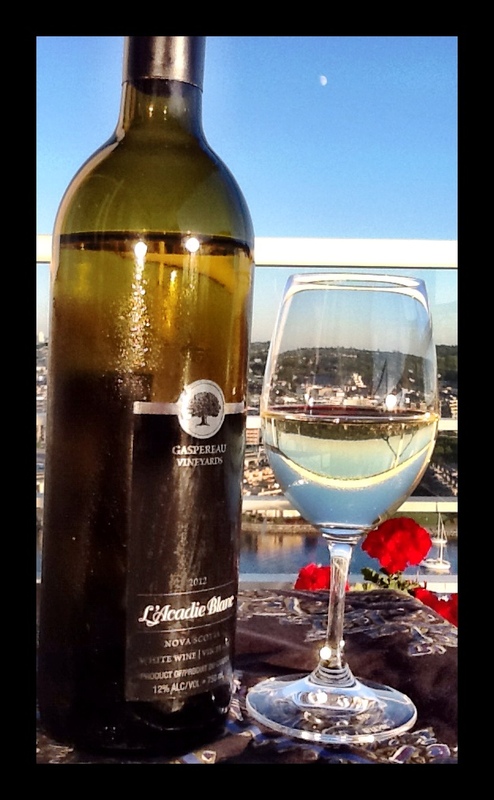 This entry was posted in L'Acadie Blanc, Nova Scotia, WHITE and tagged gaspereau vineyards, L'acadie blanc, nova scotia, White, wine. Bookmark the permalink. So glad you enjoyed it! Now it just makes us wish we were walking down Main Street Wolfville after a day of wine tasting! I wish I’d opened this one sooner – really lovely. And I can practically smell the shellfish that would go so well with it. I’d love to visit Wolfville!